I recently started using the excellent Sublime Text 2, and it’s awesome. It annoyed me though that you couldn’t open files with it directly from the right click context menu in Windows like you can with Notepad++, so I made a registry file that accomplishes that. IMPORTANT 1: The file makes changes in the registry, use it at your own risk! 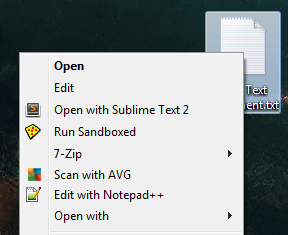 IMPORTANT 2: You need to open the file in a text editor and change the path to sublime_text.exe if it’s not located at C:\Program Files\Sublime Text 2\sublime_text.exe. Download, (edit if needed) and run this file. Now you should be able to open files and folders by right clicking! 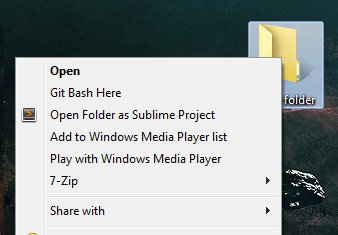 Update: You can add a “open with” context menu for Sublime by clicking a checkbox in the installer (I must have missed it). It doesn’t add an option to open folders as projects though, so you can use this reg file if you need that. My name is Daniel and this is where I post things more or less related to game development.